And so continue my offally big adventures through Russia and Eastern Europe. I’m not deliberately seeking out the innards and random animal bits, but they seem to come flinging my way in this part of the world like a kind of grisly nemesis. Because pig’s trotters are now a trendy pub favourite I didn’t really think they would be that unusual in flavour, but it turns out I was only partly right. In this part of the world it’s all about the jellied pig’s trotters, and to be honest the fact that I couldn’t differentiate between jelly and fatty foot meat I found quite disturbing. 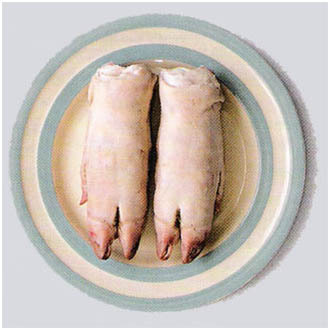 I can’t odds the taste – mostly of vinegar – but I don’t really understand why the feet are prized above different cuts. If you’re not about the trotters then Latvia is also a great place to sample delicious super-cheap dumplings by the bowlful. In several restaurants in the capital you can join a line in a self service restaurant, choose what you like (or guess, in my case, if you don’t speak the language) and they’ll weigh the end result for you to eat on the premises. I never spent more than about £2 ($1.7) on a big plateful.